Holly and Justin from New View Farm run a 5-acre project east of Stanthorpe. They are regenerating the site from pine forestry, using permaculture principles to grow fruit and flowers. They also rent a market garden from another Granite Belt grower Undercliffe Dave. Here they grow produce with other Granite Belt farmers to sell collectively at Northey St. Markets. 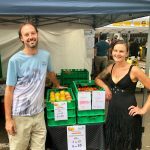 Holly and Justin’s interest in growing started with their involvement with the Queensland Herb Society, a local Brisbane group, who hold their meetings around the corner from the Farm at the Albion Peace Center. 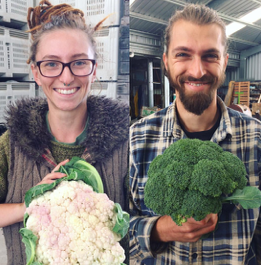 Around the same time, they started shopping at Northey Street Organic Farmers Market and Holly completed our two-week intensive Permaculture Design Certificate. The high school sweethearts got married in 2012 and spent their honeymoon WWOOFing around Canada meeting awesome farmers, homesteaders and viewing garden projects. They came back inspired and ready to start their own organic farm. Holly and Justin, tell us about your menu collaboration with head chef Glen Barratt from Wild Canary bistro at Brookfield? 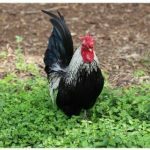 I’ve been following his passion for locally grown produce! 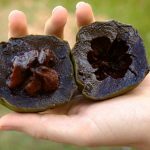 Glen is keen supporter of farmers’ markets, local produce and permaculture, and we also share a passion for unusual and unique foods! His restaurant has its own veggie garden where he grows many things to use in dishes. He invited us to speak at his producer’s lunch, a six-course degustation featuring produce from the Granite Belt Organic Growers! What are your thoughts on shopping at big supermarkets vs a farmer’s market such as Northey St. Organic Farmers Market? 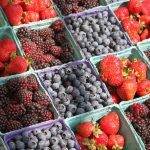 There are lots of benefits to shopping at a market – more of the produce is local, it’s much fresher and you know exactly who you are supporting through purchasing it. There’s also much more variety available! A good market still has the diversity of a supermarket – we can get meat, fish, dairy, fresh produce and dry goods. We think Northey St Organic Farmers Market is more exciting because we can also get homewares, beauty care, clothing, chocolate and natural therapies! Supermarkets expect farmers to provide ever higher quality produce for less and less money, despite the many difficulties in growing. They don’t support locally grown either and have a crazy desire to wrap everything in plastic! Agreed. Have you noticed any shifts in attitudes towards natural/organic farming over the time you’ve been growing and selling at the Northey St. Organic Farmers Market? Yes, there is a definite trend towards a desire for natural foods which is evident in many facets of life right now. The prevalence of healthier eating depicted in the media, the rise in alternative eating choices through new diets, and the increase of organic products available in the supermarkets, shows that people are paying more attention to what they are eating right now. As well, we have noticed an increase in patrons at the markets who are interested in knowing where and how their food is grown, and even who the farmer is. We believe that farmers are starting to get the support and recognition they deserve. What would you say the main challenges of farming are for you? The weather is getting more variable and it’s much harder to predict what is going to happen. Some of the farmers of past generations, that have been farming for 40 years, remember a time when you could rely on the forecast. People can advise on weather trends in the region to some degree, but even that isn’t always correct. For example, you used to be able to expect that frost would happen around Anzac Day each year and this year we only had a really light first frost at the end of May, a whole month later. Our next biggest challenge is efficiency! It’s something we are getting a lot better at. There’s a fine line between financially viable and a huge waste of time. We came into farming with some plant growing experience but no farming or market experience, so the learning curve has been pretty steep. We try to be fast learners! 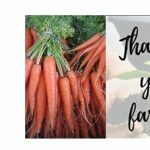 And the online farming community really helps us, giving us ideas on how to organize and innovate, find info on varieties and cool tools to get. It’s great having instant feedback on how the season is going for other farmers too, so you can be aware of certain pests doing the rounds etc. It all helps us become more resilient farms. What about the pros of living the farming life? We think the biggest pro is that we live abundantly! 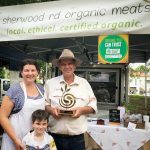 We love having a rainbow of delicious, nutritious food at each meal and we love being able to share that with our customers, especially through a place like Northey St. Organic Farmers Market. Another pro would be the connection with nature. We get to work out in the fresh air, surrounded by the plants and animals each day. You really get to experience each season. Love your work Holly and Justin, I am so impressed by your enthusiasm and dedication to ethical farming. Thanks for your time! Visit the Granite Belt Growers stall at Northey St. Organic Farmers Markets! They are there every Sunday 6am-11am.